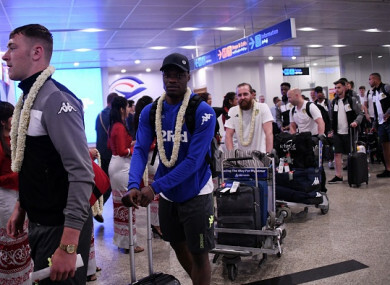 LEEDS UNITED ARRIVED in Myanmar today, kicking off an end-of-season tour mired in controversy over whether the visitors should be playing in a country the UN accuses of ethnic cleansing against its Rohingya Muslim minority. But the Championship team — and their Italian tycoon owner who has business interests in Myanmar — have come under intense criticism for the visit from British lawmakers and rights group Amnesty International. They say the club should not be touring a country whose military has forced some 700,000 Rohingya over the border into Bangladesh since last August. A line of waiting representatives from their local bank sponsor placed garlands of flowers round the players’ necks before they were driven to their hotel. Amnesty UK Director Kate Allen said the visit was an “odd choice of country to choose to tour”. “Far too often sporting events have been used as a cheap PR tool to ‘sportswash’ the stain of a country’s human rights record,” she added. Radrizzani defended the visit, saying the trip could have a “positive impact”. The team have suffered an underwhelming season back home with a mid-table finish that dashed hopes of a comeback for the club that was relegated from the Premier League in 2004. Email “Despite pleas to cancel, Leeds United arrive in Myanmar for controversial tour”. Feedback on “Despite pleas to cancel, Leeds United arrive in Myanmar for controversial tour”.